Our famous SpellGround play mats are made of a soft, yet durable, microfiber that is slightly fuzzy to the touch. 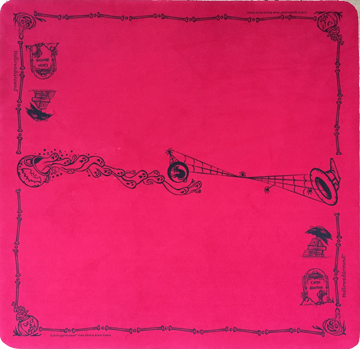 This unique fabric is even thicker and more durable than our Original SpellGround fabric that launched the now collectable mats from the 1990's. 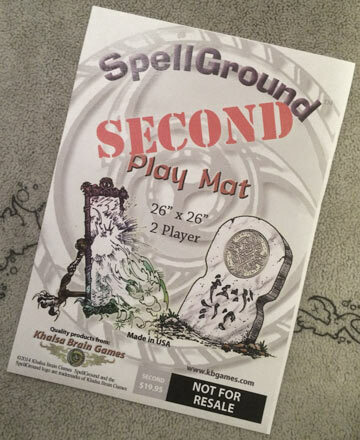 SpellGround Play mats: Durable pieces of gaming history. Jeff Brain’s original art graces these newly minted SpellGround Classic play mats - staying as true as possible to the original mat’s look and feel. We’ve brought back a piece of collectable card game history - so you can make some gaming history. Khalsa Brain Games sets sail with this new SpellGround celebrating all that is Wond-Aaargh-Full about Pirates! 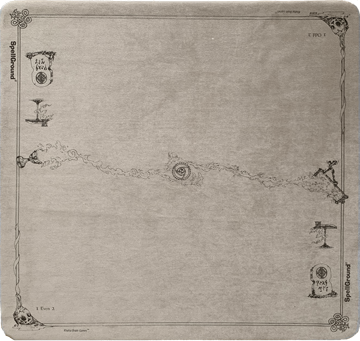 From treasure grabbing scurvy dogs, to fish-bait traitors, this mat tells a story of plunder, riches and sailing the high seas. Khalsa Brain Games recruits artist Tony Steele to spin a dark twist on our original SpellGround design! Align yourself with Dark forces that work their arcane magic to level up your game, while Nightmarish creatures test your opponent’s sanity! Ascend the Steps to Glory! Ancient temples face off in centuries old feuds, and in the valley lies neutral ground. From artist Ellen Thomas comes the new Pagoda SpellGround. No need to grab a wooden spike or garlic in your hunt for Khalsa Brain Games' 2017 edition of our vampiric special edition HallowedGround™. This spooky mat comes in blood-sucking red (fabric) and black (ink) and is printed on V4 fabric! Pagoda - Two Player On Ultra V5! Ascend the Steps to Glory! Peer past the temple to the cliffs beyond to see the silhouette of the feuding clan. From artist Ellen Thomas comes the 2 player Pagoda SpellGround on our premium Ultra V5 fabric. Approximately 26" x 26", these new mats printed on black V5 fabric with stunning blue ink. Festival Ground 2018/19! - Yr of the Dog! Loyal, honest, amiable and kind! These are all qualities of those born during a Dog year under. In celebration of the Chinese Year of the Dog, these new mats use the lucky colors of brown and purple. Approximately 26" x 26", our latest FestivalGround is printed on light brown V4 fabric with purple ink. The Retro's original design 'un-does' some of the slight changes over the years, returning to our classic logo, unbroken lines along the side, and magic particles that hug our center logo more closely. Using the more affordable V4 fabric, this 2-player mat comes on a light tan fabric with black ink. Our latest premium fabric - Ultra V5 - in light Nickel! The Retro's original design using our original art from 1994, 'un-does' some of the slight changes over the years, returning to our classic logo, unbroken lines along the side, and magic particles that hug our center logo more closely. 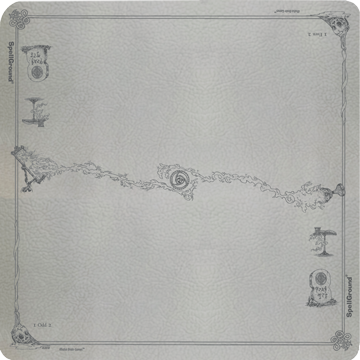 This 2-player mat comes on a Nickel colored fabric with medium grey ink. The nickel color is a blend of light tan, grey, and even light blue, creating a unique and gorgeous Retro SpellGround. Winter is coming... on Ultra V5! and a Snow Wizard approaches from the north! Celebrating the season, as the earth moves furthest from the sun, with each day growing shorter. 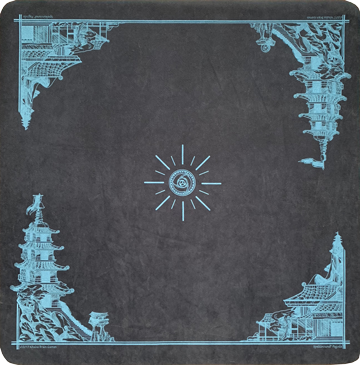 This 2-player mat comes in an light-blue Ultra V5 Fabric with dark blue ink. Align yourself with Dark forces that work their arcane magic to level up your game, while Nightmarish creatures test your opponent’s sanity! Coming soon for 2 players in our Ultra V5 fabric... green fabric with blood red ink! Show your opponents some love! In this special edition Love SpellGround Goblin cupid takes aim to cast his arrow’s spell, celebrating the onset of spring and new love. Approximately 26" x 26", lovingly printed on Ultra V5 . 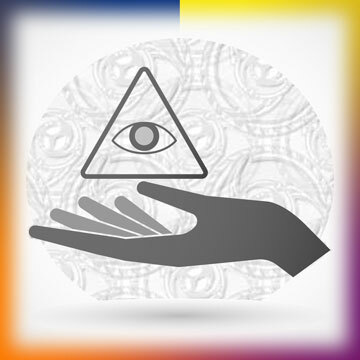 For nearly 25 years... Khalsa Brain Games has created cloth play mats with unique designs. Our new poster shows the design of every mat we've created in those 25 years! Each poster ships separately via Priority Mail. *Free Helm while supplies last. Khalsa Brain Games sets sail with this new SpellGround celebrating all that is Wond-Aaargh-Full about Pirates! 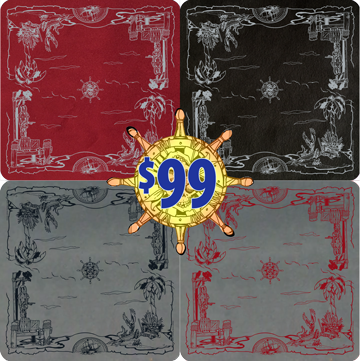 From treasure grabbing scurvy dogs, to fish-bait traitors, this mat tells a story of plunder, riches and sailing the high seas. We've created four variations of the Aarghonaut. 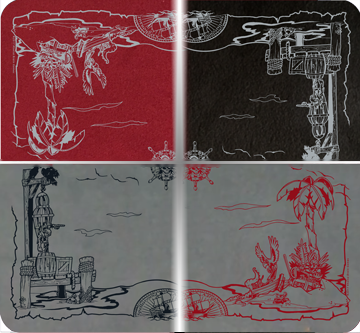 Red and Black fabric with grey ink, and grey fabric with red and black ink. 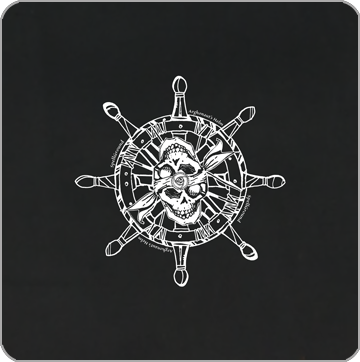 Two-player mats are approximately 26"x26"
Khalsa Brain Games lent an ear to all ye scurvy dogs who said "Give me the Wheel!" So, we riffed off the original Arghonaut to create this white ink on black fabric using just the center wheel and skulls! Avast ye' bilge rat whut deserves the black spot!! Plunder ye a treasure chest o' Aargonaut SpellGrounds! Fer' the scrawny sum o'$99 hoist all four into yer hold, and our gnarly crew will dispatch them w' haste! Score ye' a some Maximum Booty. 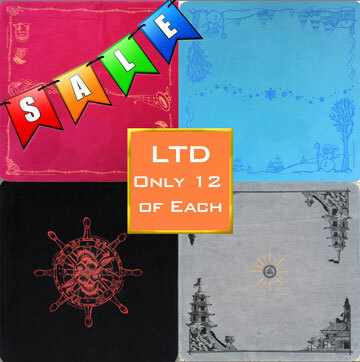 LIMITED EDITION MATS - ON SALE! 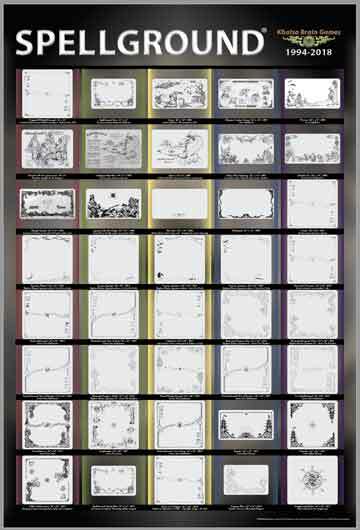 With every new release of a SpellGround, we pull a dozen aside to create a truly unique play mat. Each Limited Edition series is printed in a separate color ink that sets it apart from the others. On sale at 50% off! Availability varies depending on current releases. All LTD's are currently printed on V4 fabric. There are NO LTD's Available for Ultra V5. 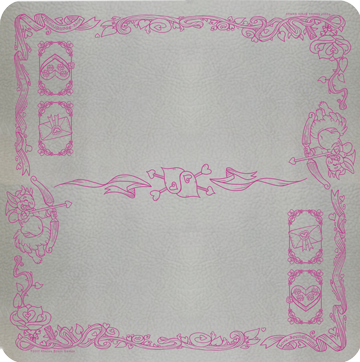 "Seconds" are mats that are typically slightly misshapen (not square enough), or have slight blemishes (usually on the back). They're priced between $20.95 and $30.95 and are NON-returnable. While not perfect, they look just fine laying on a table ready for play. Also, we've marked these on the back with "Seconds" (or 2nds), and have done it in an ink/marker color that more closely matches the color of each mat so the text won't readily show through the front. Can't decide which mat you want? Have an extensive wardrobe and want to match your clothes to your SpellGround? Selection and pricing will vary depending on inventory, but the list of what is included will be detailed using the link below. Check out our listings on for limited releases & special sales. Thank you so much! I LOVE the Seasons line, and can't wait for more!! I love your mats and have been collecting them! I'm trying to catch them all. I love the playmats u create... keep doin' what you're doin'! Thank you for making such great mats! I love them, and I love the design on the new Seasons mat. I can't wait to use it. Thank you! I really love my original 2 Player Grey, so I have to get more! Keep up the great work! I love your play mats! This will be my second, Keep up the good work! Love your mat! Can't get enough of them... Best mats ever!!! I love you guys! :D I've bought from you before and can say you produce some of the best quality play mats. Since 1995, we’ve been making the premiere play mat for Collectable Card Games. 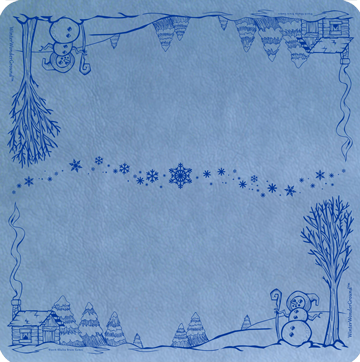 Over the years we’ve created our hand crafted mats in many styles, sizes, colors and themes. 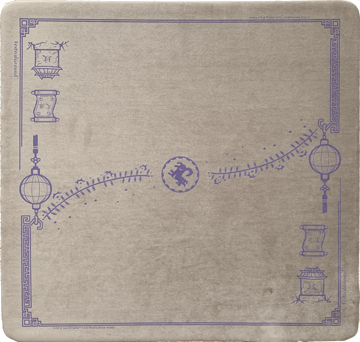 Today, we’ve brought back our original two-player mat, now available as the SpellGround Classic. And ‘yes’, they’re made of a soft/fuzzy fabric that’s nearly identical to our original mats from the 90’s. screen printed, and then lovingly folded and packaged. You might call us a ‘boutique’ manufacturer - as production runs are usually in the hundreds - not thousands. If you’re a fan of our mats already, you’ll know that they are incredibly durable. Many of our mats, which are nearly 17 years old, are still in use and can often be seen at tournaments and conventions. "Win as if you were used to it, lose as if you enjoyed it for a change." "I would prefer even to fail with honor than win by cheating." "Do good to your friends to keep them, to your enemies to win them." "For to win one hundred victories in one hundred battles is not the acme of skill. To subdue the enemy without fighting is the acme of skill."